I grew up immersed in the world of craft shows and flea markets, and never realized how many secrets I knew to success in this world until I started maintaining my own flea market booth in my 30’s. 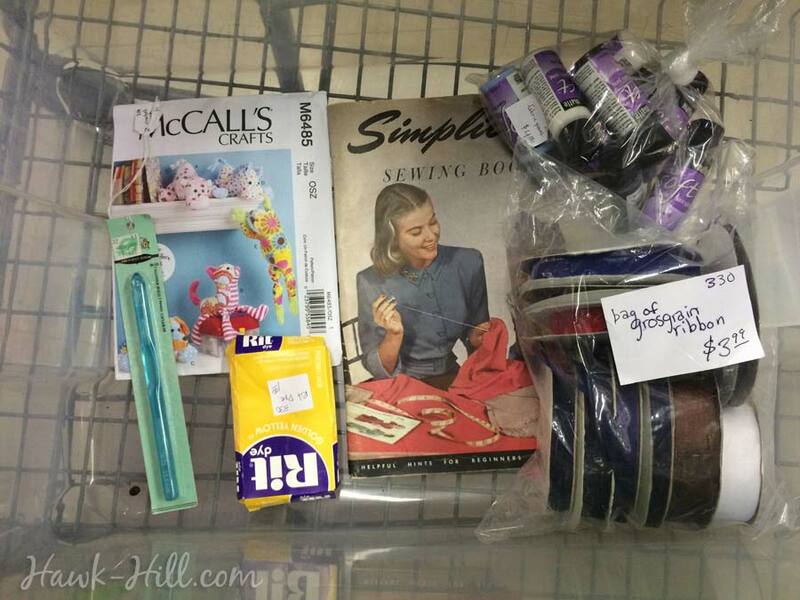 In this post I’m excited to share some of my secrets with other sellers and vendors. 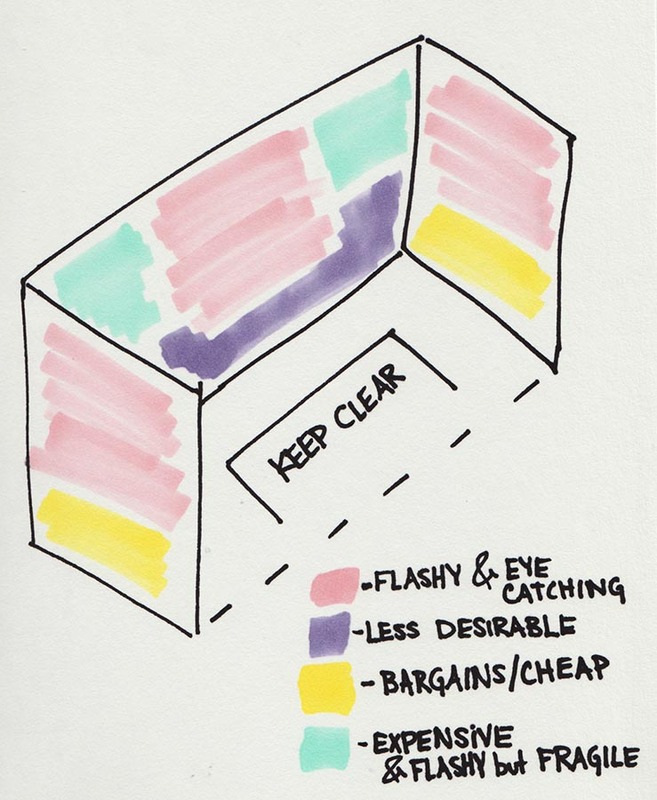 Note that most (but not all) of this article applies mostly to flea market booths that are year-round flea market facilities rather than flea market events where the seller is present through the sale. My tips focus on how to acquire inventory, reduce loss and breakage, and boost sales and profits in a booth that is not maintained or supervised daily. You’ve made the plunge! You’ve invested in a booth, maybe you’ve even got a few months experience under your belt by cleaning out odds and ends. What next? 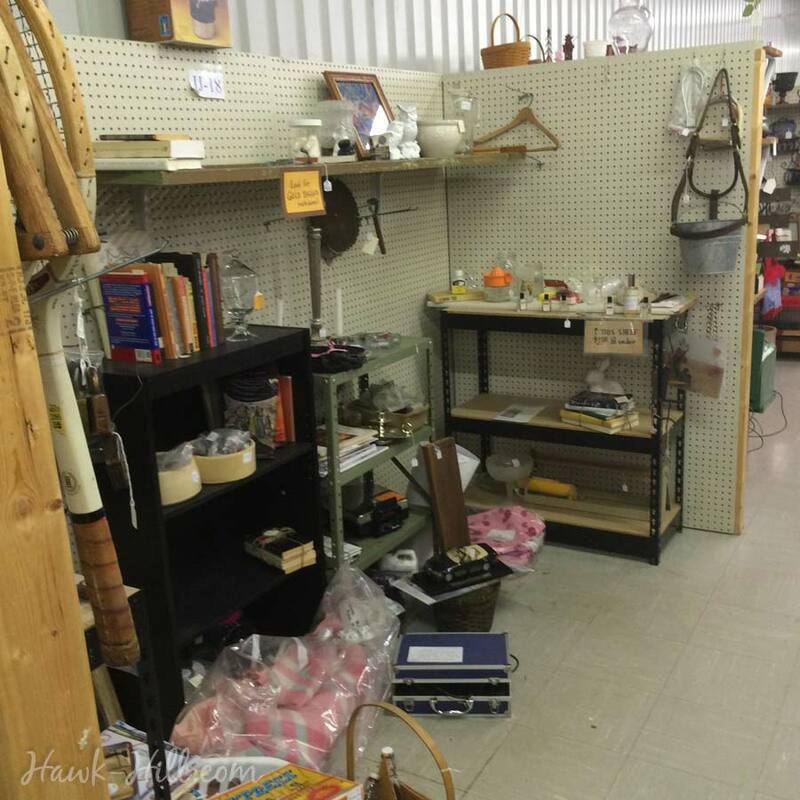 Where to source new flea market booth inventory? How to arrange a booth for maximum profit and minimum loss? How to reduce theft and breakage? How to get the really niche stuff sold? Most items in my both were common, priced under $20, or widely appealing- but when I placed an item in my booth that was a specialty item (for example: bicycle parts or horseback riding equipment) or took in a lot of similar items (for example: a mason jar collection or art supply stash) I always posted a corresponding ad on Craigslist, advertising the item(s) and directing the buyer to my flea market booth to purchase the item. Pairing Craigslist with my flea Market booth relieved me from the inconvenience (and, particularly as a single woman, the creep factor) of meeting people to sell items through Craigslist. Instead, I could direct them to a third-party location with staff on hand to take their money. I was paying booth fees and a percentage anyway (11% at my flea market) so I was deliberate about using their services whenever possible to make my life easier. Using a booth as Craigslist go-between meant no hassle scheduling or meeting a buyer or figuring out how to process their non-cash payments. When I loaded interest-specific items into my booth, I always added a corresponding local craigslist ad. In this case, obscure dressage and vaulting horse tack sold out of this booth in days via a craigslist ad, without which it might have lingered for months. Re-using trumps recycling every time. Most cities have at least one recycling center where people can drop off larger quantities of recyclables or bulkier items than pickup can accommodate, and in many cities recycling centers are open for self-service. With permission, you should be able to remove anything you find for FREE. Making the Joplin, MO Recycling Center part of my regular errands each week generally netted enough sell-able products to cover each month’s booth rental fee. On some trips I left with hands empty, often I left with just a glass jug or pickle jar (both consistently sellable for a couple bucks) or a handful of vintage books, but on a few lucky occasions I scored a collection of glassware I priced and resold for hundreds of dollars, a box of vintage toys worth $50+, or a cache of old stationary and atlases. 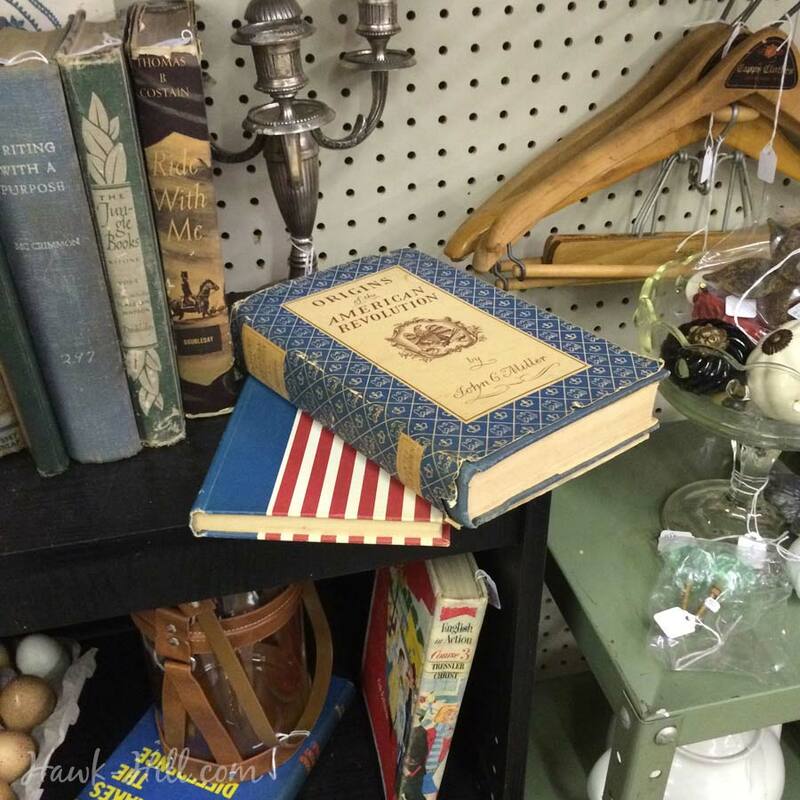 See more ideas for getting free flea market inventory. The book selection at the recycling center almost always included what appeared to be donations of old private book collections. I could grab these vintage books for free and sell them $2-$10, depending on condition, topic, and author. Arranging your booth is important, and speaks to particular types of customers. Arranged Booth vs Compressed Booth. 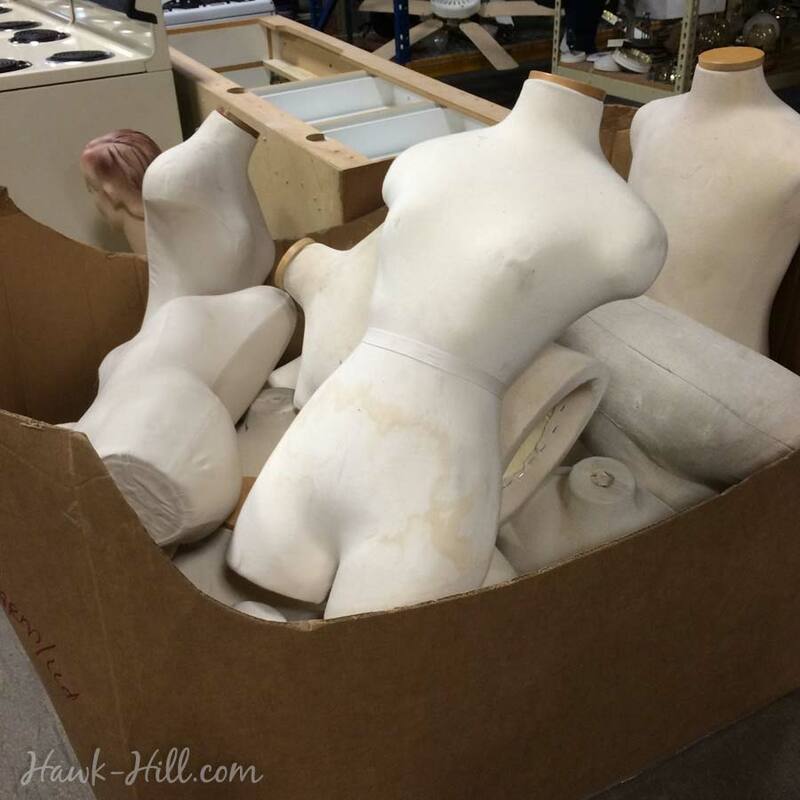 TIP: Stalk your local Habitat for Humanity Restore for used shelving. The shelves in my booth were scored for $5-$10 each at a Habitat Restore, compared to $30+ new. When I left my booth after my move to Seattle, I even sold the shelves out of my booth for a profit! Here’s how I structured the content of my booth for maximum attention and profit. You want to be sure that the most visible parts of your booth are exciting to a person walking past briskly, and that when they turn to look into your booth, the items at eye-level are flashy and, optimally, great values. If you can catch the customer’s eye and convince them that even these things they don’t want look nice and are well priced, they are likely to stop and scan the rest of your booth for treasures. If you have one on hand, a Foodsaver can work great to permanently seal zip-top bags in a pinch, but if you expect to sell many small or loose items, a heat sealer will pay for itself in theft and damage prevention. Delicate paper ephemera (like decks of cards or stationary), tiny collections (like fountain pen nibs or napkin rings), or low value items that aren’t profitable to price individually can be grouped together and sealed in a permanently sealed bag. It won’t prevent theft, but it will help keep honest people honest and make pieces just a little less tempting to steal for thieves. TIP: Don’t waste time individually pricing items under $2 or so. Instead, group with like items, bag, and seal, pricing the bag at a group price. A plastic sheath also makes paper or fragile items easy to price without damaging the finish and prevents wear and tear to original packaging by providing protection from the oils and dirt on hands that will pick up and examine the item. TIP: For tiny, but higher value items, place the item in an 8×8″ bag or larger, place a piece of white cardboard cut to fit the bag behind the item, write your price on the bag, then seal with a heat sealer. Doing this makes your item visible, harder to steal without being noticed, and easier to display in your booth. 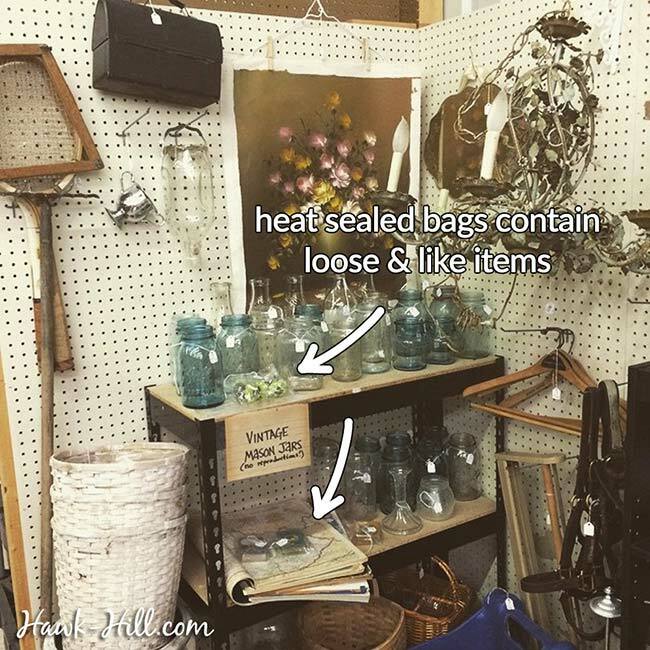 Bagging similar low-value items and then pricing the bag for your flea market is a great way to move small items, reduce time pricing, and deter theft. This reduces time spent pricing and reduces the risk of small items being shoplifted. There are certain items I have learned to look for when I visit the ReStore: chandeliers, small furniture, and vintage frames. Occasionally I discover great deals on unexpected and easily resellable items, like this pallet of dress forms that were $15-$20 each and resold in my booth for $35-$50. DISPLAYING CHANDELIERS: to sell chandeliers in your booth you’ll need a safe way to display that’s secure but still allows a customer to remove & purchase. I recommend a bracket made for hanging plants. Screw this sturdy bracket into a stud behind the wall of your booth and hang the chandelier from the hook at the end. I like these brackets because regular/flat brackets can allow the chandelier to slip off if mishandled, but this type with a hook can hold it securely and far enough from the wall that it hangs naturally. Be sure to hang at a height so an average height person can remove the chandelier for purchase. 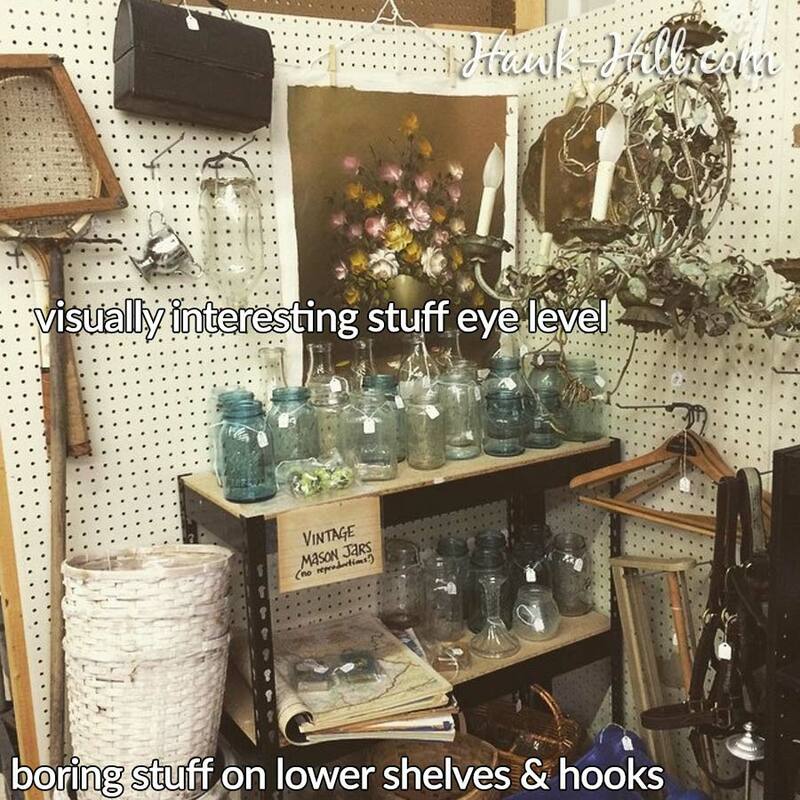 A hanging basket bracket is the best way to display chandeliers in your flea market booth. TIP: use BIG price tags and a sharpie to price hanging items such as chandeliers. 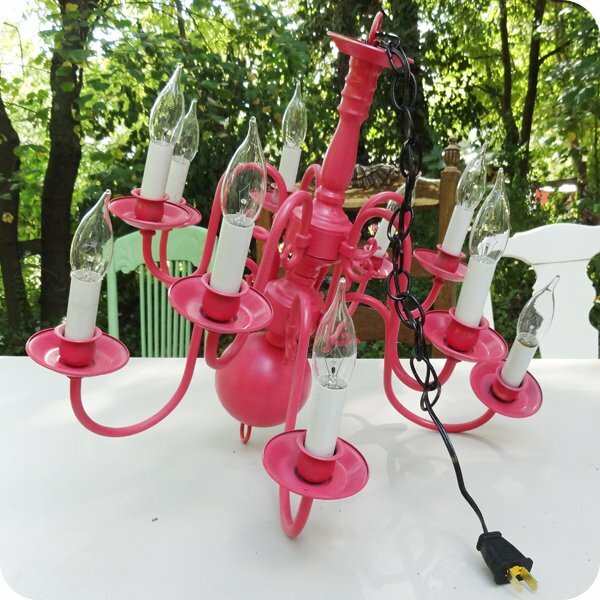 Clear pricing helps to avoid giving shoppers a reason to move the chandelier off the hook and, upon seeing the price, leave it sitting on the floor of your booth where it might get damaged by foot traffic. Make sure the price is on both sides of the tag and clearly visible. 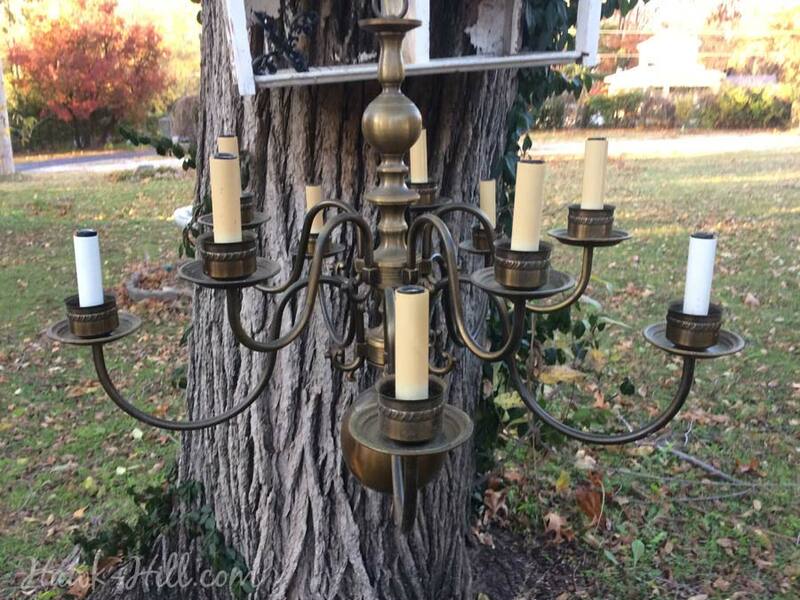 Chandeliers like this one usually are priced about $15-$20 at my ReStore. With a coat of white or pink paint and a $2 part installed to convert them to a plug in lamp, I could consistently resell for $35-$50 in my booth. In June 2015 I opened my flea market booth in Missouri. In August 2015 I decided to move to Seattle for graduate school. The following year involved trips back to the area about every 3 months, during which I would spend time pricing and reloading my flea market booth. My goal became to simply stuff the booth as full as it could possible get before leaving, and then absolutely forget about it until my next visit to the state when I would pick up my checks, clean the nearly-empty booth, lower the price on some of the remaining items, and reload the booth to overstuffed and overflowing all over again. The result: SUCCESS. I might have sold a bit more by regularly reorganizing and refreshing, but when time is money, it’s nice to know that a flea market booth can be profitable even if you can only give attention to it a few days in a year. It does, of course, assume that you have inventory to reload the booth with, though. My life transition from a 3,000 square foot house to 280 square foot apartment provided plenty of inventory and, frankly, a very low-stress way to part with my possessions slowly. Eventually, my belongings sold estate-sale style when my Missouri home sold, but by the time of the sale I’d already reduced the contents of the house by about 40%, getting much better prices on my stuff than the final estate sale netted. Coming back to a sad & empty booth was normal: but with reorganization and refilling, it was full and ready to leave in 24 hours. The general rule of retail is to make pricing abundantly clear, but I’m convinced a person who shops at flea markets does so because they love the particular sort of hunting one does when flea marketing. 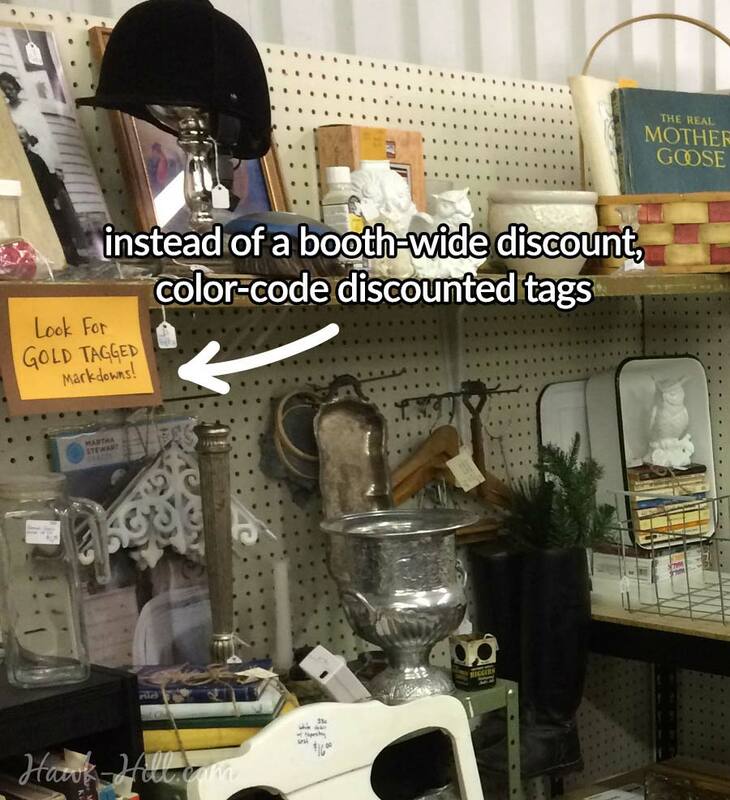 To that end, instead of a booth-wide discount, which would discount things I wasn’t ready to cut the price on, I color coded. When I was ready to discount something, I’d staple a new bright gold tag to the old tag. The gold tags became like Easter eggs as customers scanned my booth looking for the gold tags (in the process giving a closer look to my entire booth and the majority of items that were not discounted). Refinishing furniture is great if you’ve got lots of time and a high tolerance for the tedious work of stripping (or even just chalk painting). In reality, lots of people comb flea markets for pieces that DON’T look refinished, and instead have a rich patina and signs of age. One of my secret weapons is Kramer’s Antique Improver. Expensive, but stretching a long way, it’s an oily solution that you rub onto the surface of wood or metal and without any elbow grease, it dramatically transforms the finish (I had good luck with finished and unfished pieces, and even chipping veneers)- creating a ready-to-sell piece in a few minutes instead of a few hours. I loved picking old finds out of trash heaps and barn-clean outs, running them through the dishwasher (yes, even small to medium size wood items) then applying this and watching the piece come back to life. For 5-10 minutes of my time, I could boost the resale price of a basic old wooden box from $5 to $20, and the result was even better on furniture. “Feed-N-Wax” which I demonstrate this method on in another post, is a similar product for a lower price but after using both I think it takes more elbow grease and more product to get the same result. Consider time investment before refinishing- and instead try a surface treatment. 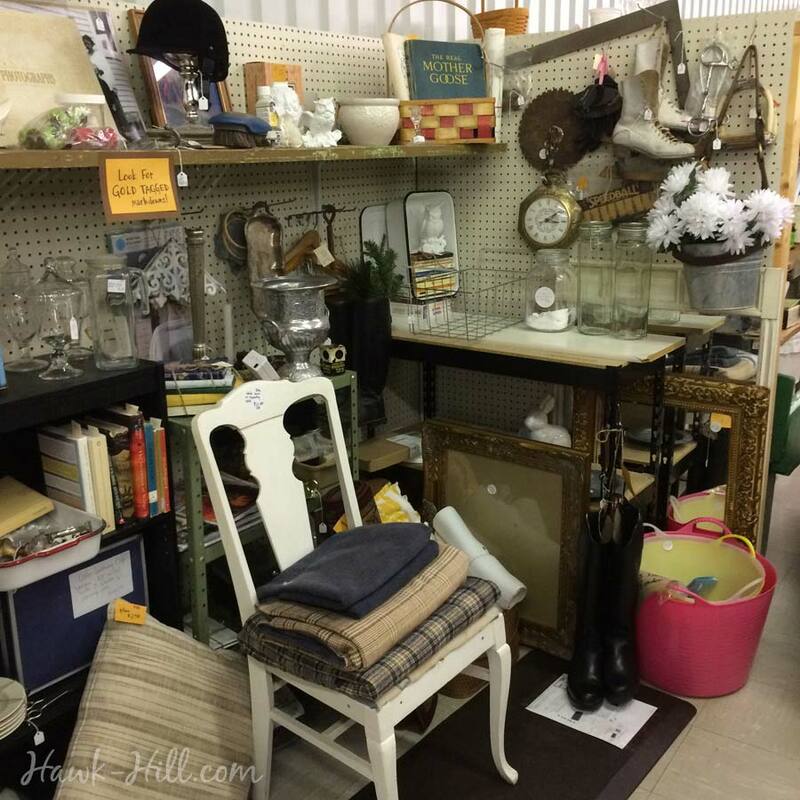 These 9 tips made my flea market booth a big success, each month profitable and a great excuse to thrift and flea market even after I was “done” decorating my own home. My booth profits helped keep my own home decor shopping fun and no-guilt since I knew that I could justify buying something new for my own home with the knowledge that whatever in my house it replaced I could take to my booth and resell. What about you? 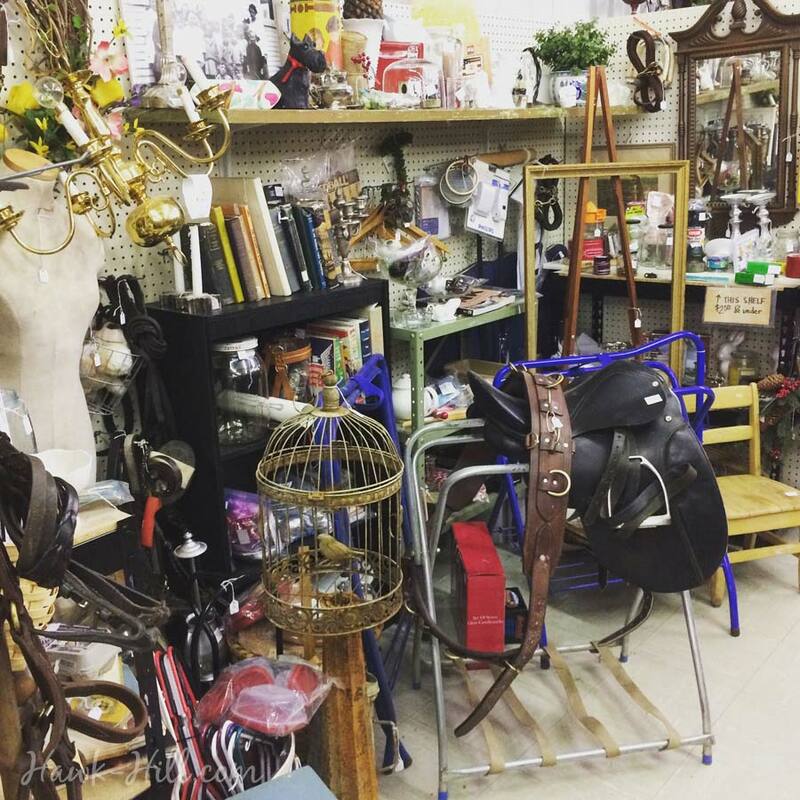 Have you taken a dip in the waters of owning a flea market booth? What are your tips for finding new inventory and boosting profits?